Visiting Akumal Beach and Grand Cenote will get you outdoors. Ruinas Mayas de Tulum and Cobá Zona Arqueológica Cobá are good opportunities to explore the local culture. Next up on the itinerary: tour the pleasant surroundings at Playa Paraiso, take in the exciting artwork at MiNiAtUrE art Gallery, soothe aching muscles at some of the top local wellness centers, and stop by Mixik. 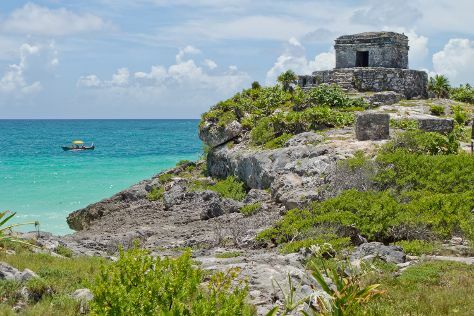 To see photos, maps, where to stay, and other tourist information, read Tulum trip builder. Durham, USA to Tulum is an approximately 11-hour flight. When traveling from Durham in June, plan for slightly colder days in Tulum, with highs around 83°F, while nights are about the same with lows around 72°F. Wrap up your sightseeing on the 5th (Mon) to allow time to take a bus to Playa del Carmen. You'll enjoy a bit of beach vacationing at Playa Delfines and Parque Los Fundadores. Take a break from the city and head to Scuba & Snorkeling and Swim with Dolphins. The adventure continues: find something for the whole family at Xcaret Eco Theme Park and don't miss a visit to Quinta Avenida. For ratings, other places to visit, traveler tips, and other tourist information, go to the Playa del Carmen trip itinerary planner. Getting from Tulum to Playa del Carmen by bus takes about an hour. Other options: take a shuttle; or drive. June in Playa del Carmen sees daily highs of 83°F and lows of 72°F at night. On the 8th (Thu), wrap the sightseeing up by early afternoon so you can travel to Mexico City. Start off your visit on the 9th (Fri): examine the collection at Frida Kahlo Museum, tour the pleasant surroundings at Alameda Central, then admire the masterpieces at Palacio de Bellas Artes, and finally make a trip to Zocalo. On the 10th (Sat), you'll have a packed day of sightseeing: steep yourself in history at Chapultepec Castle, see the interesting displays at National Museum of Anthropology (Museo Nacional de Antropologia), then examine the collection at Galeria de arte de la SHCP, then explore the ancient world of Templo Mayor Museum, and finally delve into the distant past at Metropolitan Cathedral (Catedral Metropolitana). To find traveler tips, reviews, and more tourist information, you can read our Mexico City travel itinerary planner. Traveling by combination of ferry, taxi, and flight from Playa del Carmen to Mexico City takes 5.5 hours. Alternatively, you can do a combination of bus and tram; or drive. The time zone difference moving from Eastern Standard Time (EST) to Central Standard Time (CST) is minus 1 hour. Prepare for a bit cooler weather when traveling from Playa del Carmen in June: high temperatures in Mexico City hover around 75°F and lows are around 57°F. Wrap up your sightseeing by early afternoon on the 11th (Sun) to allow time for travel back home.